PETALING JAYA: Malaysia has become the preferred listing destination for Sunway City Bhd’s (SunCity) proposed real estate investment trust (REIT) although it is not ruling out other proposals for reverse takeovers in Singapore and Australia. “The authorities in Malaysia are very proactive and doing their level best to get the more established companies to list in Malaysia,” SunCity executive director Datuk Jeffrey Ng told StarBiz yesterday. Industry sources added that companies also had a more positive view following the revamp of main and second boards into a unified board, further improvement in processes and procedures as well as liberalisation of the 30% bumiputra quota in 27 service sub-sectors. “Malaysia is definitely a preferred destination,” said Ng. “But we are not closing our doors to other opportunities. If something very firm comes up, we will study it in the best interests of shareholders, one of which is GIC (Government of Singapore Investment Corp).’’ Early last year, SunCity was reported to be more keen on listing in Singapore where the tax regime is more attractive to REIT investors in relation to withholding tax. However, the global financial crisis, which erupted in the later part of last year, has changed the scenario and investors turned risk averse. In terms of mandate, this represents a fresh opportunity to select possibly new parties that can give the best terms. Under the old mandate, the global investment banks were Goldman Sachs and UBS while the local investment banks were CIMB Investment Bank and RHB Investment Bank. Among the factors involved are market timing and the need to balance yields in the REIT market and bond yields, which represent the cost of funds and is an indicator used in the calculation of REIT pricing. Investors would also weigh their options in the REIT and bond markets. StarBiz recently reported that backed by assets valued at RM3.7bil, the proposed REIT listing is possibly the largest in the country. 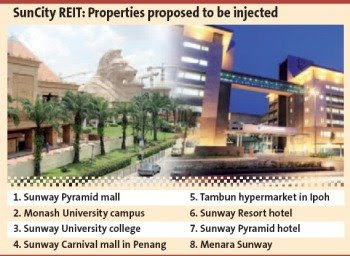 According to the report, about 75% of SunCity’s operating profit of RM175mil for the first half ended Dec 31, 2008, was from its property investment assets and SunCity was expected to receive total rental income of RM285mil this calendar year of which 70% would be from Sunway Pyramid Shopping Mall. AmResearch managing director/regional head Benny Chew suggested that SunCity list its REIT at a point when property stocks were trading close to their net asset value. However, other analysts pointed out that SunCity’s proposed REIT would have assets with synergistic benefits in the integrated resort city, education, medical and office, retail, hotel and leisure theme park. GEORGE TOWN: Belleview Group is launching residental and commercial properties on the island with an estimated gross development value (GDV) of more than RM500mil this year. Group managing director Datuk Sunny Ho told a press briefing that the projects comprised 227 houses for Palmyra Residences in Balik Pulau, 1,300 condominiums at three high-rise schemes in Air Itam, 62 terraced and semi-detached properties in Bukit Dumbar, and the 1st Avenue shopping mall complex in George Town. “We are launching now because of the lower raw materials prices. Steel, for example, is now about RM2,000 per tonne from about RM4,000 earlier this year. “The prices of other materials have dropped by about 30% compared with earlier this year,” he said. Banks were also offering attractive housing loans at an all-time low interest rate of 2.2% per annum, he said, adding that Belleview also believed the global economy was on its way to recovery. The Palmyra Residences comprises double-storey terraced and semi-detached houses priced from RM373,000. The properties have built-up areas ranging between 1,625 and 1,976 sq ft. In Air Itam, the condominium units under Melody Homes, All Seasons Park and All Seasons Place will be built on a 20-acre site, which will also house a 250,000 sq ft commercial complex. In the third quarter, Belleview will launch 1st Avenue, a shopping mall with an estimated gross commercial area of 600,000 sq ft, next to Komtar. CHINA, Abu Dhabi (UAE) and Saudi Arabia are expected to invest RM5 billion to develop a 354-hectare township based on tourism and Islamic concept, at Segari, near Lumut. The three countries have appointed a local company, Terang Jaya Kayangan (M) Sdn Bhd to manage the project. Terang Jaya Kayangan (M) Sdn Bhd, Chief Executive Officer Datuk Zainal Abidin Hamid said the new township would comprise a theme park, floating shops, shopping mall, hotel, education centres, hospital and a five star resort. "The township will also comprise low cost, medium cost and exclusive homes plus government buildings. "The site for the development is strategic as it is situated near the sea and surrounded by hills. It will certainly attract foreign investors, especially those from the middle-east countries, to buy their second homes here," he told reporters in Lumut today. Zainal Abidin said the project was expected to start by June next year and completed in 2020. He added that when completed, the new township would offer 40,000 job opportunities for professionals and non-professionals. KUALA LUMPUR: UEM Land Holdings Bhd is in talks with two local banks for RM350mil in funds to finance its projects in Nusajaya. Chairman Tan Sri Dr Ahmad Tajuddin Ali said the amount was scaled down from RM850mil it had sought earlier as banks were tightening their credit facilities in view of the current economic slowdown. Tan Sri Dr Ahmad Tajuddin Ali (left) and Wan Abdullah Wan Ibrahim looking at the UEM Land Holdings Bhd 2008 annual report on Wednesday. “The funds are for the second phase development of Puteri Harbour and also for East Ledang development,” he said after the group’s AGM yesterday. Tajuddin said the group was projecting a 20% growth in revenue this year over the RM511.6mil revenue it chalked up last year, focusing on projects in Nusajaya in Iskandar Malaysia and also in Cyberjaya. He said the group was also targeting for 6% return on equity this year, almost the same as last year, given the challenges it had to face as a result of the economic downturn. “We admit that the group is facing difficulties now as the market is not doing well. However, we will try to achieve the target by implementing strategic and different marketing approaches,” he said, adding that the group might defer launching some of its projects to a later date depending on the market situation. Tajuddin said currently, the group still had about 9,000 acres in Nusajaya for development and would proceed with the plans, design and approval process for future projects as it wanted to be ready once the market improved. “Apart from Nusajaya and Cyberjaya, we are evaluating certain land in the Klang Valley for acquisition and will announce it once the sale and purchase process is done,” he said. Managing director and chief executive officer Wan Abdullah Wan Ibrahim added that the group was still looking for other new bankable projects and might seek more funds. “Our current gearing is also low at 0.35 times for our property section. If we find other new bankable projects, we will apply for more loans, even going back to the same banks,” he said. He also said although the market was challenging, the group still managed to get buyers, especially international buyers, for its property projects in Nusajaya. KUALA LUMPUR: Sunway Holdings Bhd units Sunway Holdings (Vietnam) Sdn Bhd and Sunway Property (China) Ltd have agreed to dispose of Hochimex Nominee Co Ltd and its subsidiary for US$17mil (RM59.33mil) cash to Mega Methods Sdn Bhd. Mega Methods is a wholly-owned unit of Sunway City Bhd. Hochimex owns Sunway Hotel Hanoi Liability Ltd Co, which operates the Sunway Hotel Hanoi. HANOI: US developer Starwood Hotels plans to build two luxury hotels in Vietnam, including a 5-star resort on the central coast, the government said yesterday. Starwood Hotels & Resorts Inc plans to build a 330-room Le Meridien hotel on China Beach, where US troops once went to relax on leave during the Vietnam War. The stretch of coastline has become a magnet for tourism and five-star hotels. In addition, Hyatt and Marriott resorts are also planned. KUALA LUMPUR: Mudajaya Group Bhd has been awarded a project by Tune Hotels Sdn Bhd for the construction of a hotel in Johor Baru. The contract is to be completed by March 19, 2010. MUDAJAYA Group Bhd’s (5085) wholly-owned unit, Mudajaya Corp Bhd, has accepted a letter of award from Tune Hotels Sdn Bhd to build a seven-storey low-cost hotel in Johor Baru for RM19.89 million. The project is expected to be completed in March 2010 and to contribute positively to the earnings and net assets for the financial years ending December 2009 and 2010.